The yacon, which is a member of the sunflower family, is grown primarily for its edible roots. While it looks like sweet potatoes or yam on the outside with its brownish, sandy skin, inside, the yacon looks more like a juicy fruit such as the apple and the pear. Just peel off the skin, wash it, slice it up into pieces, and eat it raw. It feels just like a pear or an apple to the bite, with a crunch accompanying small bursts of juice. It can also be boiled or sautéed. Use quickly after peeling, like and apple, they will discolor. Perfect in salads, coleslaw and as part of a vegetable crudités platter. Unlike regular root crops whose carbohydrate content eventually turns to starch, then sugar, when ingested, the yakon stores carbohydrates in the form of inulin and not starch. High in inulin, it serves as a sucrose-free food for diabetics and since its carbohydrates pass through the digestive tract unmetabolized, it is perfect for those who suffer from obesity. 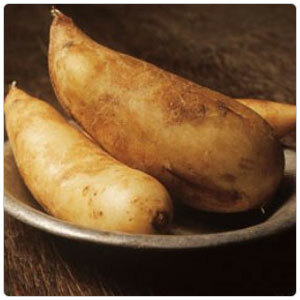 The yacon is also low in calories and high in fiber, making it a very nutritious food.